Do you often end up recalling the hard work you put into launching your dance studio? Whether you’re a well-established business or it is just a startup, you would have gone through trials and tribulations to get your dance studio off the ground. Prior starting, there is a lot to consider from staff to your class schedule. The operational framework you put in has a far-reaching effect on nearly every part of your business. If proper care is not taken care of, this might lead to risk in the long term. However, with dance studio software at your fingertips, you can streamline your studio’s day-to-day operations, thus enabling you to focus more on your passion. 1. FEEL THE CHANGE – You must be just doing fine with your business. The workload is intensifying, competition is growing, and number of students is also increasing. But what about the backstage tasks such as accounting, scheduling, reporting and managing? These are also full-time jobs where you need to bring in another staff member. What if at this point dance studio software steps in! Instead of recruiting another staff member, you can rely on this software to keep all the data organized at one place. You can access all information anywhere. This can also help the students in a way that they can pay their membership dues or manage class schedules. Data Backup – Data storage plays the main role in influencing your software’s efficiency. Prior buying any system, its recommended to check its standard protocol for data backup. Price – Of course, the cost of software will be a factor in your decision. So instead of settling for a cheaper but weaker product, settle down for the one that is feasible for your studio. Usability – Don’t go for the software that is a headache to set up. It is highly advisable to go for the one that is designed to be easy-to-use and is compatible with your goals. 3. FEATURES OF DANCE MANAGER: It has an easy to use push button, and a pull down menu to navigate through other features and reports. It lets you download and access 50 reports including Income Received, Financial History, Class Rolls and Account Listings. All in all, it manages many of your operational tasks and simplifies the way your studio functions. 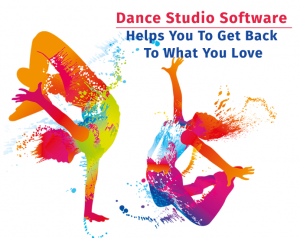 Dance Studio Software helps you keep organized and facilitates smooth operation of your studio. The benefits of such a management software are clear and undeniable. It is worth the long-term investment you need to make upfront. Best of all, it’s all automated, creating more time and less expense for you in the long run.